Gupta Empire Coins: The Gupta Empire was established in the 4th century AD in the south-east part of Bihar. At this point in time, the kingdom was a small one. This Empire heralded a new era in the history of numismatics. The Gupta coinage is believed to have been started with a remarkable series in gold issued by Chandragupta I, who was the third ruler of the dynasty, when a single type of coins with images of “the king and queen” namely depicting the portraits of Chandragupta and his queen Kumaradevi with their names on its front side while that of a goddess seated on a lion with the legend ‘Lichchhavyah’ on the reverse. Smaudragupta was the appointed successor of Chandragupta I. 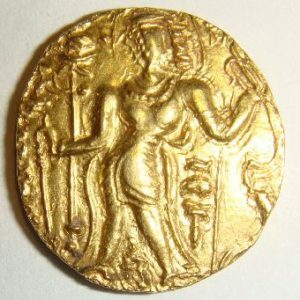 Out of the seven types of gold coins issued by Samudragupta, namely three Standard, Archer, and Ashvamedha were known to have been from Bengal. The Archer type, found from 24-Parganas (North), depicted the king standing, holding a bow and arrow with Samudra written under his left arm while the reverse is the same as on the standard type except the legend, which read “Apratirathah” meaning ‘matchless warrior’. On the Ashvamedha type of coins which came to be discovered in the Comilla district, a horse in front of a sacrificial post with a flowing banner was depicted while its reverse side showed the image of a female who was probably a chief queen standing in front of an ornamental such or spear with a flywhisk over her right shoulder and the legend Shvamedhaparakramah. Only two types of coins of Chandragupta II, who integrated “Vanga” in the Gupta Empire, were known from Bengal. His Archer type coins became the most popular type of coinage with the Gupta rulers especially after Kumaragupta I. These coins came to be found at places like Faridpur, Bogra, Jessore and Comilla districts of Bangladesh and Kalighat, Hughli, Burdwan, 24-Parganas (North) in addition to Murshidabad of West Bengal. This type had two classes namely one with an enthroned goddess and the other with a goddess seated on a lotus on the reverse with various varieties. His Chhatra or Umbrella as it was known in the Sanskrit language depicted a king offering incense on an altar while an attendant held an umbrella over him on the front side and a goddess standing on a lotus on the reverse was known from the single specimen discovered from Hughli district. His Lion-slayer, Horseman, Couch, Standard, Chakravikrama along with the King and the Queen on Couch types have not been found in Bengal. 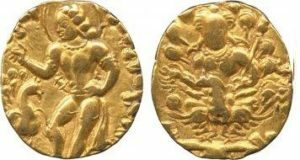 Kumaragupta I, issued as many as sixteen types of gold coins, was also represented by Archer in Hughli, Horseman from Midnapore and Hughli, Elephant-rider from Hughli, Lion-slayer from Bogra, Hughli and Burdwan and lastly, Karttikeya from Burdwan in Bengal. 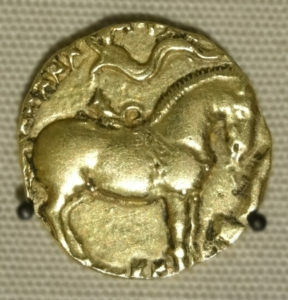 The Horseman type coins depicted the king riding a caparisoned horse with weapons like a bow and a sword on the face of the coin while a goddess sitting on a wicker stool, sometimes feeding grapes to a peacock, on its backside. The Elephant-rider type showed a king riding on an elephant holding a goad. An attendant holding an umbrella sat behind him while its reverse had a goddess standing on a lotus with the legend Mahendragajah. The Lion-slayer type had a king, armed with a bow and an arrow, either skirmishing or trampling a lion on the front and a goddess seated on a couchant lion and the legend Sri-Mahendrasinghah on its backside. The most enchanting in the entire series was that of the Karttikeya or Peacock type which depicted the king in the “Tribhanga” posture feeding a bunch of grapes to a peacock on the obverse and the god Karttikeya seated on a peacock along with the legend Mahendrakumarah on the reverse. Two types of Archer from Faridpur, Bogra, Hughli, Burdwan and the King and Queen from Midnapore were of the four known types of Skandagupta, to have been found in Bengal during archeological excavations so carried out there. The latter depicted a king and a queen who was identified as goddess Laksmi by some scholars standing to face each other on the obverse and a goddess seated on a lotus along with the legend Sri Skandaguptah on the reverse. Archer type coins of Kumaragupta II from Kalighat, North and South 24-Parganas, Midnapore; Vainyagupta from Khaligha and Hughli; Narasinghagupta from Kalighat, Hughli, Murshidabad, Birbhum and Nadia; Kumaragupta III from Hughli and Burdwan and lastly Visnugupta from Kalighat, Hughli, and 24-Parganas, North have all been found in Bengal. Most of these coins which were so found had musical legends inscribed in pure Sanskrit, highlighting the issuer’s achievements on the obverse of the coins. A symbol in geometrical design is usually found on the reverse of Gupta coins and most of the coins depicted a Garuda standard on the obverse. The Guptas followed somewhat of a complicated metrology for their gold coins. Though they were generally believed to have followed the Kusana Empire’s standard weight of 122 grains for their early coinage after the Roman empire, and the Indian Suvarna standard of 144 grains which commenced from the time of Skandagupta, yet we can observe a gradual increase in their weight from about 112 during the time of Chandragupta ranging from 1 to 148 grains for the coins of the last rulers. One thing which also needs to be made a note of was that their pure gold content remained 113 grains throughout barring the coins of the last three rulers. As per the sources of data so available, it can be inferred that gold coins were accepted at their real value instead of their face value. As a matter of fact, the Gupta inscriptions have used the terms, Dinara, and Suvarn, in order to distinguish the lighter and heavier types respectively. In addition to the gold coins, some varieties of silver coins of Chandragupta II, Kumaragupta I and Skandagupta were also discovered at Muhammadpur near Jessore in 1852 while one coin of Skandagupta has been reported from Chandraketugarh. 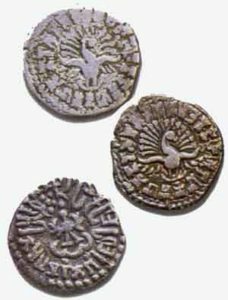 Apart from these coins, no other specimens of silver coins were found in Bengal but the reference to them from the Gupta epigraphs from Bengal unquestionably indicate their occurrence in the country. These coins were issued on the standard weight of 32 grains and were referred to as “Rupaka” in the inscriptions. No copper currencies, however, have been reported from Bengal.